Tackling climate change, CO2 emissions play an important role. In Germany, the energy sector produces most of the greenhouse gases, carbon dioxide counting for the most part. Stationary energy as used in buildings, in particular, consists of fossil fuels causing climate-damaging CO2 in many cases. The quality and technics of buildings, such as air conditioning, lighting, building material, heating and cooling systems determine the use of energy. 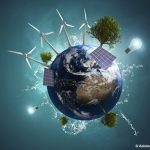 However, due to latest energy-efficient technology, insulation, alternative and renewable energies, buildings can be operated climate-neutral. The carbon footprint is also part of sustainable hotel management: The hotel’s carbon footprint and the footprint per guest and stay must be kept as low as possible through initiatives and latest technology. Moreover, climate protection projects help several Green Pearls® hotels to achieve a climate-positive status. This occurs when more carbon dioxide is bound than emitted. For holidays with a good conscience. 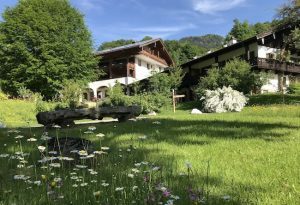 Through its initiatives, the Hotel Speicher am Ziegelsee became the first climate-neutral hotel in Mecklenburg-Western Pomerania in 2010 and is climate-positive since 2017. 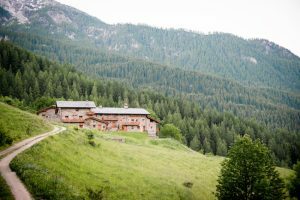 Thanks to 100 % green electricity, 100 % bio district heating, promoting e-mobility and heat recovery in the entire irrigation technology, guests stay climate-neutral. The measures helped to save 72.1 % more CO2 per guest and night and to consume 59.1 % less final energy in 2017 than hotels in the same star category during the same period. Avoiding long-distance delivery, the hotel sources predominantly regional products. Employees are trained and learn about energy efficiency, they are encouraged to cycle to work. 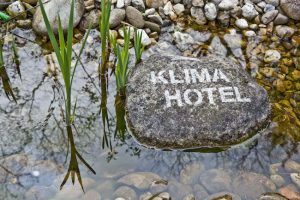 Residual emissions are compensated by a reforestation project in Panama as part of the initiative “Klima-Hotels Deutschland” (English: Climate Hotels Germany). 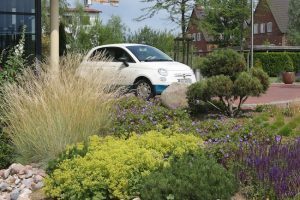 Moreover, since 2012, Hotel Speicher am Ziegelsee supports the local project Moor Futures watering drained moors to bind carbon dioxide. At the Berghotel Rehlegg, renewable energies ensure a CO2-neutral energy supply. The hotel produces 70 % of the required electricity by itself: The energy generated by 100 m2 of solar thermal plant replaces 14,000 liters of heating oil annually, and is used to heat the indoor and outdoor pool and provides most of the hot water demand. In addition, a photovoltaic system generates 60,000 kWh of electricity. The cogeneration of heat and power of two combined heat and power plants (CHP) achieves additional 370,000 kWh of electricity. The CHP is operated with CO2-neutral propane, yet, the association PrimaKlima (English: Good Climate) plants trees per ton consumed on behalf of the hotel. The remaining demand is sourced from 100 % hydropower. Berghotel Rehlegg also compensates for the remaining emissions supporting the Panama Forest Project. Voltage controllers and maximum guards are also installed in all devices and lightings to prevent attrition. The first zero-emissions hotel in Milan is located behind the historic façade of the Hotel Milano Scala. Effective thermal insulation was integrated during the refurbishment of the building. The hotel is heated and air-conditioned with an environmentally friendly water-to-water heat pump. An automated system controls the use of energy by checking the temperature of each room; a magnetic contact disables the heating system as soon as a window is opened. Taps in the rooms are equipped with filters to reduce water consumption. For an eco-friendly stay, guests are also encouraged to use public transportation. The hotel saves energy in the kitchen alike: All ingredients are sourced as regionally as possible to minimize transport and exhaust pollution. Herbs, some fruits and vegetables grow on the hotel’s own rooftop terrace. Induction cookers and convection ovens also contribute to a good energy balance. Amidst the mountains of the Maira Valley, the historic hamlet Sagna Rotonda has been restored to the highest standards of energy efficiency. The energetically autonomous eco-village derives electricity from a photovoltaic system of about 8 kWp, heat from an electric heat pump and reduces energy consumption through LED lighting and induction stoves. Moreover, natural materials such as cork and lime were used as thermal insulation of the walls saving energy while heating. During the annual closing, Sagna Rotonda forwards its generated electricity to the regional power generator. 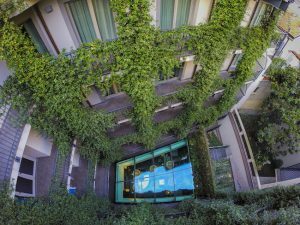 The Creativhotel Luise in Erlangen is climate-neutral since 2010. Due to supporting the forest project in Panama, the hotel is climate-positive since a few years. Solar systems and district heating generate heat and provide for the required hot water. The air conditioner is powered by 100 % green electricity from hydropower monitored by a central control system reducing the air-conditioning overnight. The Creativhotel Luise also focuses on a regional supply chain. Electric and solar mobility as well as car sharing are additional measures. Discarded furniture and electrical devices are passed on to students or people in need, thus, contributing to the sustainable use of resources and avoiding emissions in the manufacturing and supply of new products. With the Cradle-to-Cradle® certified renewable hotel room, the climate-friendly concept is consistent: All materials used and installed are either 100 % reusable or 100 % biodegradable.